Once a client contacts us about the home buying process, we often get the question, “How long will this process take?”. We certainly understand why they are asking. Many people have lease termination dates to consider. 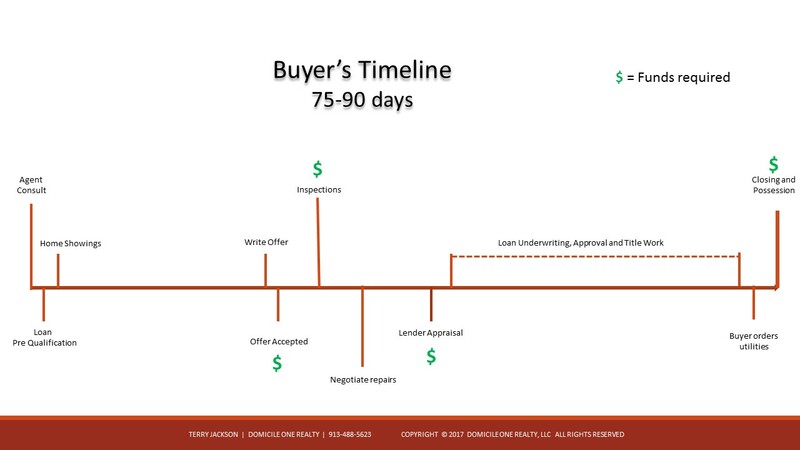 While every buyer is different regarding how long it takes for them to find a property they want to offer on, we typically tell our buyers to factor in about 45 days after they go under contract. The green dollar signs indicate where the buyer will be spending money. Upon contract signing, the buyer will submit an earnest deposit. This will be credited back to the buyer at closing, but in the meantime, it is a cost paid upfront. Inspection services are due upon completion so that will also be a cost prior to closing. Most lenders charge for their appraisal fees prior to closing. Again, this will be less money the buyer has to bring to closing, but it is still an out of pocket cost prior to. The point of having this timeline is to give a buyer a visual of the entire process and where they are on it. In addition, we want to make certain that buyers are aware that they money they spend to purchase the home is not all due at closing date.